with tears between bath and pre-lunch beers. There are few images that shock and startle me these days. And yet this one did. And it is good to know that I am not numb. Really good. 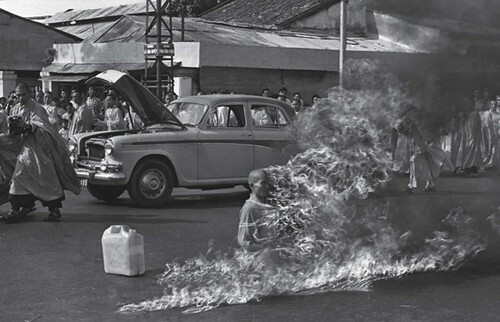 At a busy downtown intersection in Saigon, on 11 June 1963, seventy-three-year-old Thich Quang Duc, sat at a busy downtown intersection and had gasoline poured over him by two fellow monks. 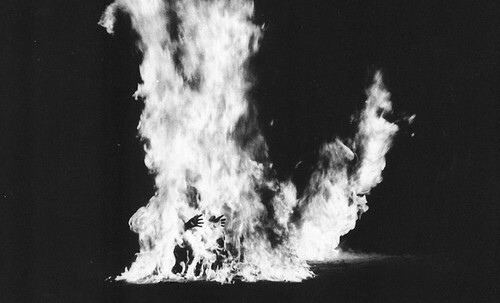 As a large crowd of Buddhists and reporters watched, he lit a match and, over the course of a few moments, burned to death while he remained seated in the lotus position. His heart did not burn and is now a Buddhist relic. and how the blood stained into foreign dust. he earns a living and they do not care.